Hyderabad is one of the rare Indian cities that have preserved its past, along with embracing the modern ways of life. Known as the City of Nizams, the city has a rich historic past. The city flourished under Qutb Shahi and Nizam’s rule. A walk along this city would confront any tourist with many historic sites, none more imposing than the majestic forts of Hyderabad. 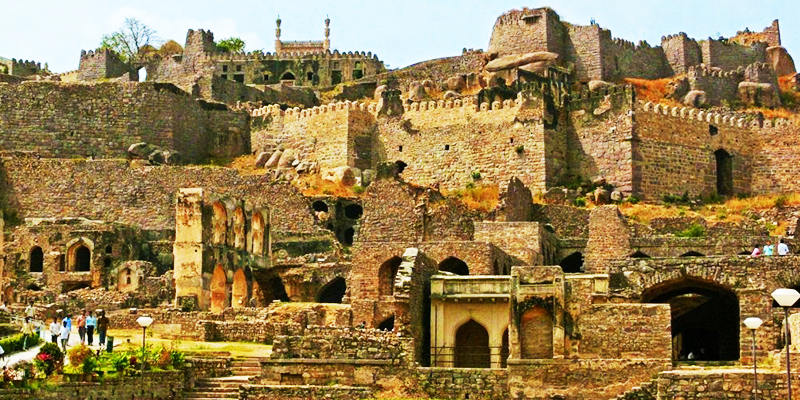 The forts within this city tell a tale of their own and serve as the prides of Hyderabad. Situated at the outskirts of Hyderabad, this citadel is known for its elaborate architecture. 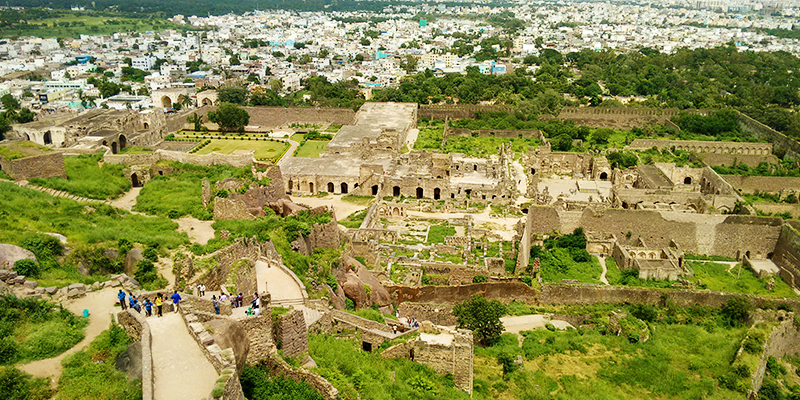 Golconda in the vernacular dialect means Round Shaped Hill, upon which the fort stands. 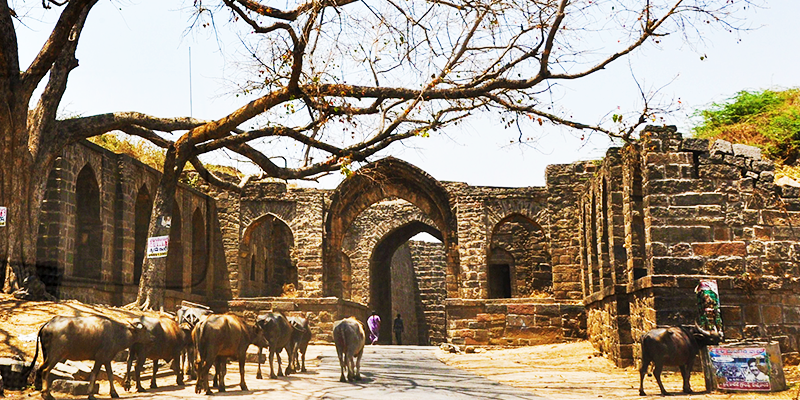 The fort served as the main defensive enforcement to protect the capital of the medieval Qutub Shahi dynasty. This fort was first constructed by the rulers of Kakatiya dynasty as a part of their western defences. 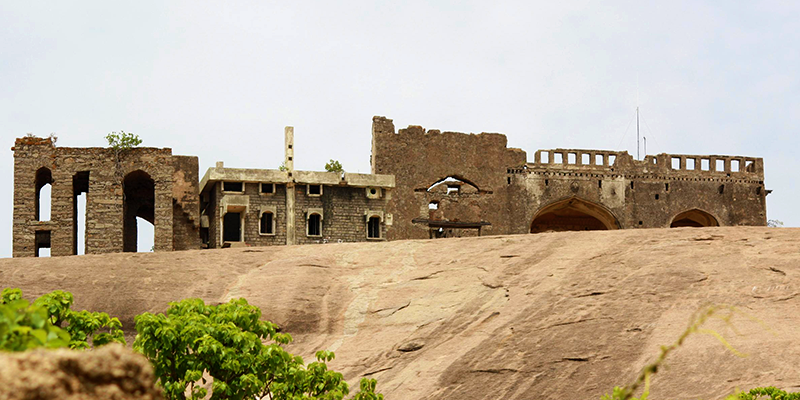 Built upon a granite hill of 120 M height, the fort is surrounded by massive battlements. The fort offers grand views of the Tomb of Qutub Shahi. Must see: Sound and light show organized within the fort. The ticket counters for this show open at 5:30 PM and the cost of tickets varies between Rs. 60-140 (depending upon class). Lying in the eastern outskirts of Hyderabad, about 51KM away on the Hyderabad Warangal trunk route, the ‘Bhongiri Gutta’ (as it is known in vernacular terms) was built in the 10th century. Situated on an isolated monolithic rock, the fort was built by the Western Chalukya ruler Tribhuvanamalla Vikramaditya VI. In its heydays this fort was considered impregnable due to the egg-shaped rock upon which it was built and the two entry points protected by huge rocks. Bhongir Fort gained prominence under the rule of queen Rudramadevi and her grandson Prataparudra II. In present times the fort has become an attraction for the trekkers. The mild gradient of this fort makes it easy for amateur hikers to condition themselves. At the foot of this fort lies the Bhongir town, a satellite township for Hyderabad. Entry Fees: Rs. 5 per adult. Must see: Spectacular views of vast fields from the lawn. Nearest Railhead: Bhongir (3.2 KM away). This fort has existed since the 12th century and served as the capital of the Kakatiya dynasty. The fort is well known for Kakatiyan arches or ornamental gates (Kakatiya Kala Thoranam) which are believed to be ruins of an ancient Shiva temple once housed within the fort. The gate contains beautiful carvings. When the Muslim invaders conquered this fort they demolished the Shiva temple. The fort was reconstructed and refurbished under various rulers which can be seen in its three concentric circular walls (each belonging to a different period). Under the Sultanate rule in the 14th century, a massive public hall was built, whose ruins are now known as Kush Mahal. There is also a huge water tank, which is known for its distinctive rock formations. Entry Fees: Rs. 15 per adult. Must see: Light and Sound show that tells an interactive history of the fort with the use of laser and sound tracks. Tickets for this show are priced at Rs. 40 for adults and Rs. 20 for children.